From LRT Buendia station, board a bus with signboaard Ayala/Rustans, get off at Rustans then walk to the carpark terminal. Got it! Me and my friends are planning to go to enchanted kingdom this weekend. Thanks for this. one way lng po ba yang 250? are there any options in commuting, if we want to travel during weekdays? 250php for one-way?! that's too much. think i'll just go there by bus. thanks for the info! anonymous, hehe ang ikli na nga di naguluhan ka pa...di ka ba taga-korokan o mentally-challenged lang talaga? yung shuttle bus na ito ba balikan na to? wheres the group sales office? yeah where's that group sales office???? wth..theres no trip on monday to friday?..ughh..! Saan ang group sales office nila? Thank you! My fiancee and I are planning to go to there next weekend. Hi! Do you have shuttle service from d airport going to enchanted? I'm from Iloilo. wala bah talaga shuttle buss ng friday??? bakit??? anoh pede ibang sakyan papunta dun?? at sa bah ang sales oofice bat d nyo sinasagot ang tanong n yan? Two way na yun 250?? Meroon ho bang san pablo laguna hanggang enchanted kingdom?? Kung meroon vacant ba sa december 22 2012??? Kung vacant magkano ang two ways??? where is the ek sales office. this post really helps :D planning to go to ek this weekend :D thanks. Hi im planning to vist ek ds wk end ..mg taxi kc aq, anu sbihn pra mkpnta dun sa edsa carpark. .? Mern dn ban. Tiket outlet dun? Or kun. Pde na dun na kmi mgbli sa ek ng tiket..tnx..
may trip po b kau papunta SM lucena ? 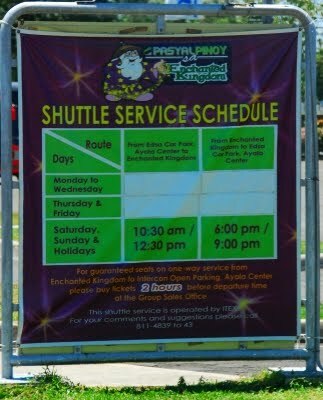 papunta lang po ba ang shuttle wala po bang sched pauwi ng manila? ano na po latest schedule ng van from Ayala to EK? weekdays and weekends sched po sana. thanks! ano po latest sched Ayala to EK pag weekends?